One of the most important things in an individual's life is health. The health of the body and mind ensures that a person lives a long and healthy life. However, when not taken seriously, worsening health can make life extremely painful. Oral health plays a significant part in keeping a person healthy. Cavities, loss of teeth and periodontal problems can lead to deadly diseases such as heart attack, diabetes and more. At North Island Dental Arts, we make sure that our patients have excellent oral health. One biggest problem is that majority of Americans suffer is from teeth loss and decay. The teeth are often subject to trauma, excessive wear and tear along with discoloration and decay. To ensure the health of the teeth, porcelain veneers are a great solution. Our veneers in New Hyde Park, Long Island not only conceal with the discolouration and stained teeth but are planted in such a way that they correct minor mis alignments. Veneers are just like all dental procedures. Veneers are applied only after the patient is given the local anesthetic. The anesthetic eliminates the chances of patient feeling any discomfort or pain. This is one of the most common misconceptions. While veneers are often placed to hide the discoloration and damage to the teeth, we opt to place them of the six front teeth where they are most visible along with lower teeth and premolars. 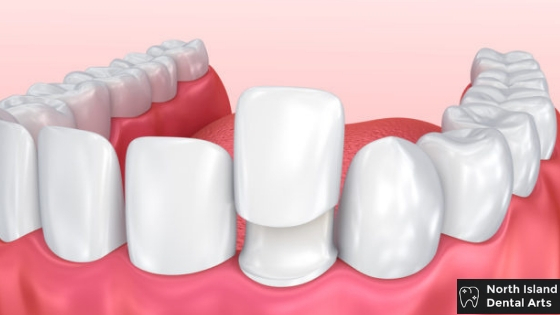 Placing veneers on the lower teeth and premolars ensure that even when patients laugh, eat or are with friends, they teeth always appear pristine from back to end. The placement of the veneer requires the teeth to the reshaped. However, the reshaping is extremely minimal and no one will ever will able to tell you the difference. Veneers only serve aesthetic purposes. The primary goal of the veneers is to make your teeth look aesthetically pleasing. They work to ensure that the overall appearance of the smile remains the same. Along with that, veneers play a significant role in correcting the mis alignments, rebuilding the molars and filling out the cheeks. One of the main functions of veneers is to ensure that the smile remains extremely natural and this cannot happen if the veneers are unnaturally white. Our experts match the thickness, size and color of the teeth with the veneers. Selecting the right dental procedure to ensure the protection of oral health is necessary. At, North Island Dental Arts we make sure that our patients get best dental service. We are one of the premier dental houses for all cosmetic dental procedures and Veneers in New Hyde Park, Long Island.